SalesAgility forked the SugarCRM project back in 2013, with a bold vision to deliver an enterprise-ready, 100 percent open source customer relationship management (CRM) system when the "commercial open source" SugarCRM project did not meet expectations . SuiteCRM is dedicated and committed to maintaining the free software ethos and to delivering 100 percent commitment to the open source community. CRM solutions have become a cornerstone of successful business and have experienced rapid commercial growth since cloud pioneer Marc Benioff  brought Salesforce to the market in 1999. SuiteCRM is a very powerful business toolkit. Beneath its mild and perhaps slightly antiquated user interface is hidden a powerhouse of business automation and management tools. SuiteCRM offers much, much more than clever contact, communication, and sales opportunity development. It provides almost all the features of a full Enterprise Resource Planning (ERP) system: product inventory, invoicing, marketing, document management, project management, support case management, event management, location mapping, email marketing, workflow automation, and more. In this article, I offer a good level of understanding of the SuiteCRM tools and modules. Equipped with this knowledge and just a modest amount of work, you can establish a fully functional business system with significant levels of automation. 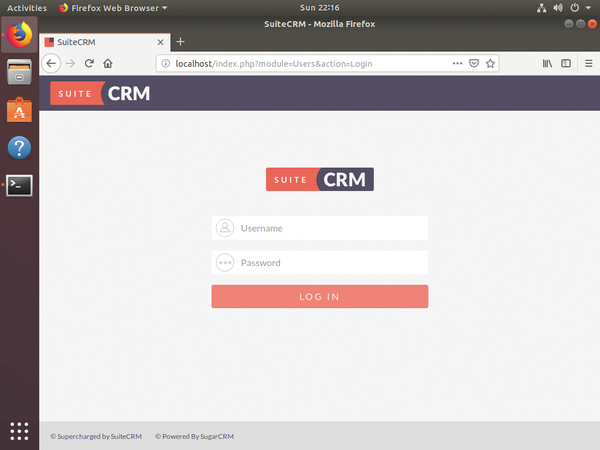 In my example installation, I put SuiteCRM on Ubuntu 18.04 Desktop, although for production usage, I would recommend Ubuntu Server. Note that I also renamed the folder created when it was unzipped to the more generic suitecrm. This step is mostly for convenience and will help with continuity as you work through the tutorial. Now copy the code shown in Listing 1  into the nano text editor window to populate the suitecrm.conf file with the details for the virtual host. To save the file, use Ctrl+O to write to the file, and then exit the Nano editor with Ctrl+X. Use the nano editor's Ctrl+W search function to find the upload_max_filesize line. By default, it is set to 2M, which you should amend to 25M. and begin the browser-based installation by pointing your browser to http://localhost . The application will recognize that the application requires installation and will take you to the Setup Wizard. After you accept the GNU GPL license, the installer checks that all the system requirements are met before sending you to a configuration window (Figure 1). After filling out this screen, click Next to continue. If you see no errors in the report (Figure 2), click Next to move to the login screen (Figure 3). After logging in, you'll see the SuiteCRM Dashboard with no data (Figure 4). Figure 1: Database configuration and administration user details. 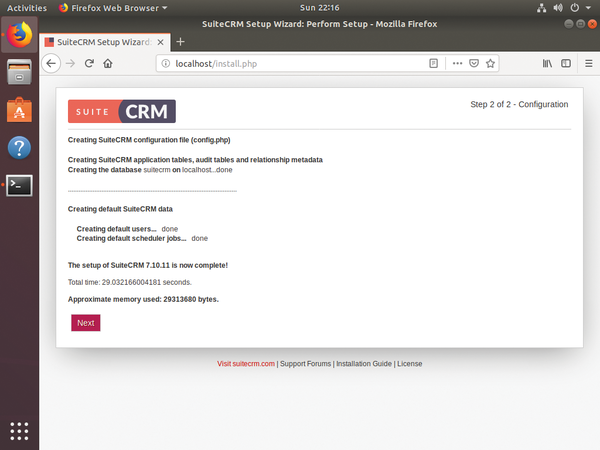 Figure 2: A successful SuiteCRM installation. 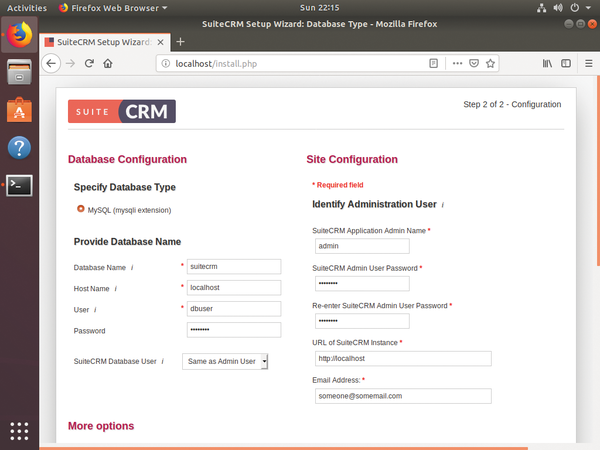 Figure 3: The SuiteCRM login screen. Figure 4: SuiteCRM Dashboard with a variety of dashlets. CRM tools are typically used to develop customer relationships and sales opportunities. When you think for a minute about how sales transactions take place, they almost always involve people buying products or services from other people, which is typically modeled in a sales pipeline. A common pipeline starts with a lead (i.e., a person that either makes first contact with you or with whom you make first contact). Those of you with a marketing background will recognize a missing step, and, indeed, SuiteCRM provides tools for prospecting and delivering marketing campaigns, including email marketing. However, I won't have the opportunity to visit that step in this article. At the start of a pipeline, you record leads in the SuiteCRM Leads module, which you will find under either the Sales or Marketing menus. To create the lead, you enter information about the person, their company or organization, where the lead came from, and summary details of any prospective sales value, if known. Notice the lead Status field is useful for providing information about a lead's progress; it can be used in workflow automation, as well. Leads can have communication information recorded against them, too. 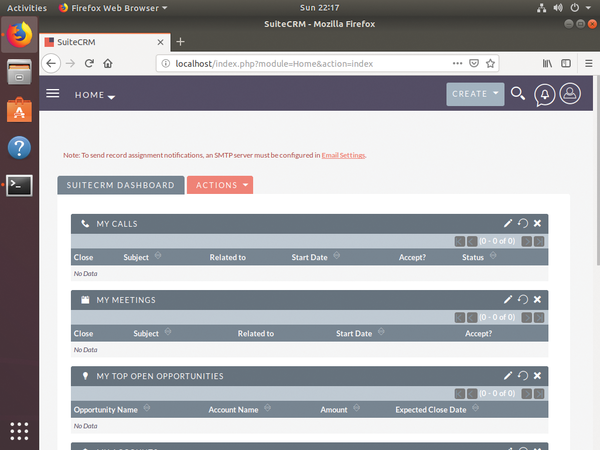 In fact, the concept of keeping a record of email communications, calls, meetings, and other notes is a very common theme in CRM, and SuiteCRM divides this information between the History and Activities subpanels. Activities are future events that have yet to be done and can include tasks, calls, and meetings with associated reminders. Reminders can be configured to provide a pop-up when they are due, which is very useful for keeping track of lots of actions. History keeps a record of actions, including email – if you configure your email client to integrate with SuiteCRM. When working as a sole trader or in a small business, keeping records like this can seem tiresome and is all too often considered overkill. However, the discipline of keeping these records can be paid back tenfold. For example, imagine that Roland has been maintaining his CRM system meticulously, and his business has grown enough that he now wants to employ a salesperson and a customer account manager. Roland employs David as the customer manager and Rachel as the salesperson. Instead of Roland having to impart months or even years of client knowledge to David, he only needs to train David on how to use SuiteCRM. Similarly Roland does not need weeks to bring Rachel up to speed with the status of each lead in the sales pipeline. Moreover, by equally ensuring the same discipline is undertaken by David and Rachel, the business can grow rapidly and exponentially, because the detailed business knowledge is held within SuiteCRM and can be shared across the business. This methodology can be applied throughout almost every SuiteCRM module. Furthermore, customer account records aggregate lead and contact history to provide a detailed historical interaction record, which can be accessed in a single click on View Summary in the drop-down on the History subpanel.